Celebrating the Winners from 2017 this edition features both the Top Dog Australia Grand Final in Canberra and theTop Dog New Zealand Final. In addition, we have an extensive feature on the first of Australia's 2018 Royal Shows - Canberra with its biggest entry for some years. With the Advance Sydney Royal Easter Show upon us, we take a trip down memory lane. Archives of 1974 make very interesting reading, with Thelma Gray's report on her experience judging at Australia's biggest show at that time. As always some wonderful articles and great reports will give enthusiasts hours of reading. 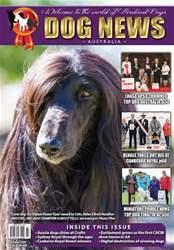 For those benched and those at home we hope you enjoy this edition of Dog News Australia.